Well, let’s start at square one. Bitcoin, Litecoin, Ethereum, Dash, IOTA and about 1,300 others are names given to open-source, peer-to-peer, distributed ledger systems. They are multiple-entry accounting ledgers, distributed across millions of computers globally. They are made secure by the constant confirmation of the other computers on the network. They are kept honest by the open-source code that is reviewed and tested by thousands of volunteer and paid programmers. Litecoin is one of 1,300 cryptocurrencies available. This technology was primarily developed for transferring value, but it has many other uses as well. It can register land titles on a secure and immutable blockchain. It can transfer shares in companies and organizations. It can manage Internet voting, micro-credit systems (such as on Reddit) and much more. Even more important are the societal implications. Poor people in “unbanked” areas (such as most of Africa) can access cheap and fast money transfer systems via SMS on a $20 cell phone. The unbanked can become their own bank, cutting out the middleman. Rich central bankers can’t simply steal money from the middle and lower class just by pressing the “print” button. Whistleblowers and defectors from abusive corporations and corrupt government agencies can sign messages and receive payments anonymously (using privacy-oriented currencies such as Monero, Dash and PIVX) without risking their lives. You can send millions of dollars across the globe in minutes for just a few cents without waiting days for the legacy banking system to get its act together (and paying upward of $80 in the wire system). And as for the criticisms—and there are many—I say, it’s a free market! Are you worried the NSA controls Bitcoin? You have 1,300 other choices. Are Bitcoin transactions too expensive? Try Litecoin. Are Ethereum transactions too slow? Try NEM. Do you think a currency should be inflationary to prevent hoarding? Use PIVX. Is Bitcoin not anonymous enough for you to pay for a VPN service in China? Use Verge or Dash. Worried that the blockchain will get hacked by a quantum computer, if those ever get invented? Use IOTA or QRL (Quantum Resistant Ledger.) Power consumption concerns? Plenty of cryptocurrencies have a lower power consumption and are way more efficient than Bitcoin. Again, you have 1,300 choices and counting. Bitcoin: The original decentralized cryptocurrency, created in 2009 by a group of cryptographers. Litecoin: One of the first “altcoins,” similar to Bitcoin. Dash, Monero, PIVX, Zcash, Verge: Cryptocurrencies with a focus on privacy and anonymity. IOTA: The first cryptocurrency without a blockchain. It uses the “tangle” instead. Ethereum, Cardano: Leading cryptocurrencies with smart contract and organizational/voting functionality. NEM (New Economy Movement): An innovative approach to blockchain, built for high performance and smart assets for business transactions. The U.S. dollar was once backed by gold but now is printed out of thin air, resulting in inflation because its worth continually decreases as more and more bills are injected into the economy. Bitconnect, USI–Tech, etc. : Any trading service that guarantees a regular percent return is a pyramid scheme. Real brokers cannot guarantee a set return on their trading. OneCoin: A centralized currency created by individuals with a history of scams. It does meet the definition of a ponzi scheme, unlike most of the other 1,300 cryptocurrencies. Onecoin has yet to release a wallet or be accepted on an exchange. Ripple: A centralized cryptocurrency favored by banks and large industries. A private company manages the software and owns the majority of the Ripple tokens. Which means they basically control the market price. Tether: A centralized cryptocurrency, pinned to the value of the U.S. dollar, created and mined by the Tether company, supposedly matched one-to-one by USD reserves. They have yet to release an audit and have been accused of various questionable practices. I am still participating because the concept of a distributed ledger has no political philosophy, no economic system and no centralized control. If I give you a case of bananas and you trade me two cases of bananas a week later, and I write in a notebook that there was a trade deficit and that I owe you 18 dollars, and you sign it, we have a pretty secure record, provided we both trust each other not to change the ledger. What if I write that I owe you 230 zingzangs? That would work, too, as long as we both agree that 230 zingzangs is worth a case of bananas. And it would sure help if other people recognize that the zingzang ledger and value transfer system is secure and are willing to sell a case of bananas for 230 zingzangs. Of course, they wouldn’t be so keen to trust the zingzang ledger if it was just a notebook held by one person and the value transfer system required a pen and the physical presence of both parties. But throw that ledger onto millions of computers, secure it with the strongest cryptography in existence, and add a thriving market of vendors and exchanges who accept that currency unit, and you have a cryptocurrency—with more “intrinsic value” than the dollar and euro could ever hope for. 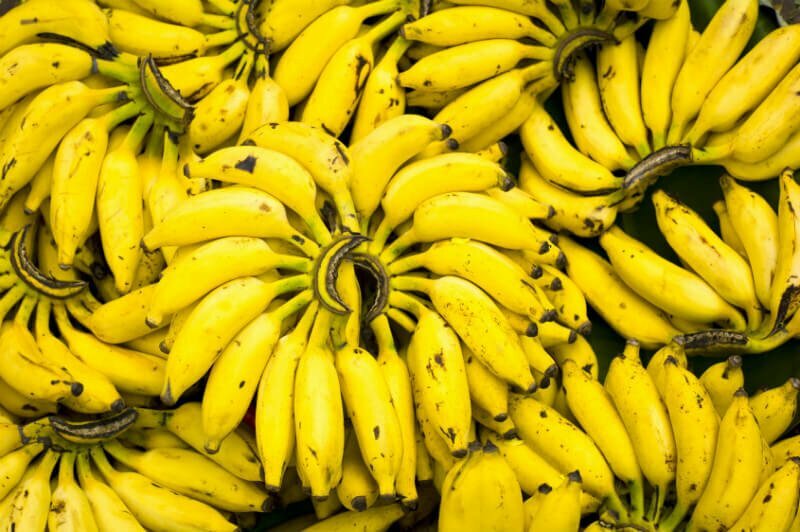 Cryptocurrencies can be used to assign value to goods such as cases of bananas. Cryptocurrencies boast more more “intrinsic value” than the U.S. dollar and euro could ever have, Peter Csere writes. Many people ask me if I think Bitcoin will continue to be successful or if other cryptocurrencies will take its place. Some insist that only one cryptocurrency will become the “favorite” and all others will fall to the wayside. I think that no one can predict the future, but competition definitely results in a healthy market. I also think that Bitcoin’s days are numbered. Recently, the Bitcoin and Ethereum networks have been slow. Network congestion has resulted in transactions sometimes being delayed for hours. Transaction fees have been as high as $15 or $20—still way cheaper than a Western Union or international wire but not as cheap as most other cryptocurrencies. Bitcoin is still a favorite as it was the first on the scene, but once merchants and exchanges begin to adapt, I believe that Bitcoin will dominate less and less of the market. It can only be updated and improved so much without a complete overhaul of its code. Whereas four years ago, most of the “altcoins” were clones of Bitcoin with a few minor changes, nowawadays many newer cryptocurrencies have been written from scratch by teams of professional developers with years of experience in this field. We even have coins such as IOTA that don’t even use a blockchain. Developers produced a new system called the “tangle,” which is resistant to hacking from quantum computers, a common but far-fetched, in my opinion, criticism of Bitcoin. One way to understand cryptocurrencies better is to compare them with traditional fiat currencies. Many people have criticized cryptocurrencies as “not being backed by anything” and having no intrinsic value. Well, aside from being backed by more computing power than the top 500 supercomputers in the world combined, a network of millions of users, and a secure multiple-entry accounting ledger, they are right that there is no physical asset behind, say, a Dash token or a Monero token. But, the problem is, then they go right back to using the U.S. dollar or the euro in their daily lives, as if that is somehow a better choice for their electronic transactions. The word “fiat” is Latin for “Let it be so.” Currencies created and managed by central banks are called “fiat currencies” because they exist simply due to the government decreeing their existence. 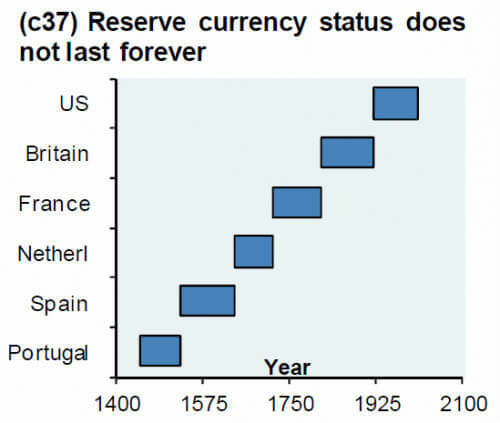 This chart shows the success periods of fiat currencies that were considered the “world reserve currency” at one point. 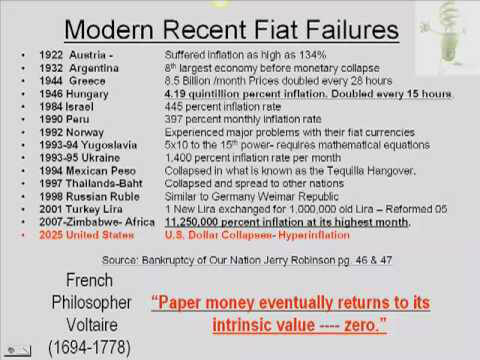 And the next image shows a selection of the utter failures of various fiat currencies over the past century. These currencies are no longer backed by gold (though when they were, even as far back as the Roman Empire, the government simply thinned out the gold when it needed more money.) A central bank printing more money and lending it to big banks is an act of legalized theft. While popular Keynesian economists such as Paul Krugman will argue that a currency needs to be inflationary in order to be useful, gold and silver (both deflationary) functioned perfectly well as money for 6,000 years before governments used legal force and other shenanigans to convince their citizens to switch to pieces of paper. The U.S. dollar is said to be backed by “the full faith and credit of the U.S. government.” Anyone who has paid attention to the U.S. national debt or the economic situation in the past few decades knows that the U.S. government does not have much faith or credit left, and neither do most of the other major governments. The entire world economy is resting on the U.S. dollar, and other major fiat currencies are in a similarly poor situation. 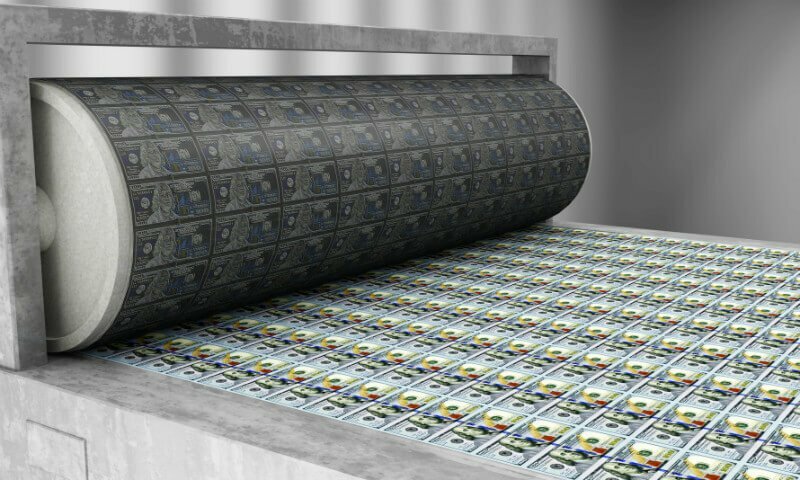 Central banks across the world are printing money like crazy, almost as if they are in a race to see who can devalue their currency the fastest without it collapsing. Governments are using this money to fund wars, subsidies for factory farms, grants for cruel scientific research on animals and other nasty things. Every time we earn or use a dollar or a euro, we are adding value to them and supporting the folks who fund these things. What’s worse is that every time they print a currency unit, your own savings goes down in value. They are a group of corrupt bankers stealing money from you to pay for their nefarious activities. They can do this because they control the money supply. You can certainly help fight this by using gold and silver when possible, but for electronic transfers, cryptocurrencies offer a far more ethical way to transfer value than the tokens of the central bankers and a far more convenient and safe way than trying to get 2 kilograms of gold across national borders in a timely manner. 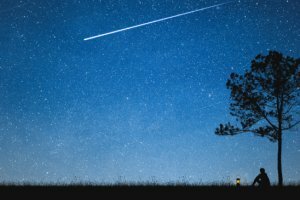 Let’s talk about the future. Will the 1,300 cryptocurrencies become a “one world currency?” Will we become a “cashless society” by using IOTA to send an international transfer? No way. My personal vision for the future does include government currencies gradually falling by the wayside and becoming obsolete but not to be replaced with only digital systems. I think gold and silver will return to their traditional role for in-person cash transactions where people do not want to deal with digital technology. And I think a variety of cryptocurrencies (but not Bitcoin) will take over the role of government currencies in electronic transactions, domestic and international wires, microcredits and person-to-person payments. Furthermore, we can increase the use of barter systems and ledgers (such as Barter Business) to reduce the need for currency in general. Let’s face it, the world’s economic systems have a long way to go before they can be considered fair and ethical. One of the most fundamental changes we can make is in the value systems upon which our economic activity is based. An independent bank separate from the U.S. government, the U.S. Federal Reserve was created in 1913 by Congress “to provide the nation with a safer, more flexible and more stable monetary and financial system,” according to FederalReserve.gov. 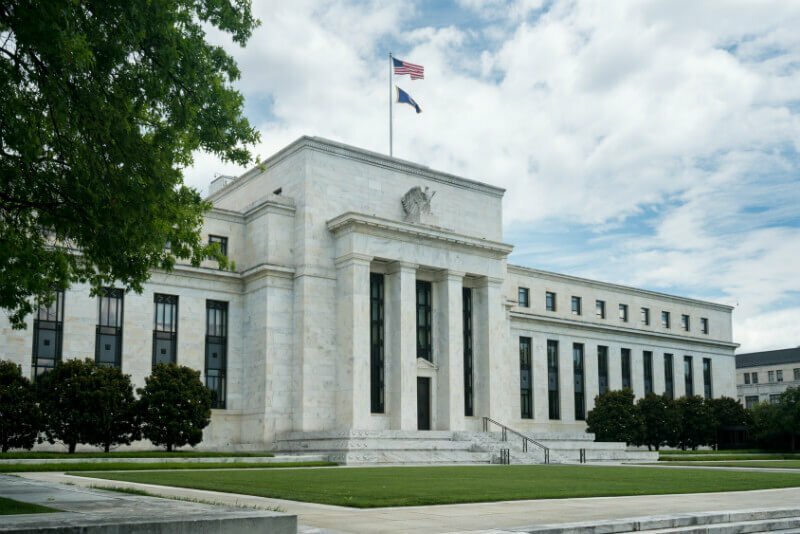 Some argue that the bill to create the Federal Reserve was railroaded through Congress by President Woodrow Wilson so the rich banking families who would soon control the Fed—and the nation’s purse strings—would get him re-elected. In conclusion, I’ll say this: Many of us realized that every time we bought meat, milk, leather or any other animal product, we were supporting a very cruel industry that hurts the environment and billions of sentient beings. Now it’s time to realize that any time we use the U.S. dollar or another currency that is centrally managed by corrupt politicians, we are agreeing that it has value, supporting their unethical activities and putting up with the perpetual devaluation that robs us of our savings. But anytime we trade that euro or yuan or U.S. dollar for cryptocurrencies, gold, silver or something else of lasting value such as high-quality grafted mamey sapote trees for our tropical permaculture farm in southeast Ecuador, we are voting for a better world and adding value to the things that are much harder for governments and multinational corporations to control. Making ethical decisions doesn’t end just with what we eat. The unit of value that we use to buy that food matters, too. Watch a basic introductory video on WeUseCoins.com. Watch a more in-depth introductory video by Andreas Antonopoulous (you will love this guy) on YouTube. Use CoinMarketCap.com to check the prices of various cryptocurrencies. Clicking on each coin also gives you the option to visit their website and learn more about them. U.S.-based individuals can use the exchanges Coinbase, GDAX or Gemini to easily buy cryptocurrency. Other areas of the world have their own exchanges. An extensive list would be outside the scope of this article. LocalBitcoins is a worldwide escrow service for buying (and selling) bitcoins from other individuals, wherever you are and whatever payment system you want to use. They hold the bitcoins in escrow so you cannot be robbed, provided you follow their guidelines. Binance.com is one exchange I’d currently recommend for buying and selling a larger variety of cryptocurrencies. Coinomi is a popular android app that allows you to store, receive, and send multiple cryptocurrencies. The Ledger Nano S is a super-secure hardware wallet (looks like a USB stick) that I’d highly recommend, and it stores multiple cryptocurrencies. If it gets destroyed or stolen, you can easily restore the funds with a series of 24 “recovery words” that you type into an app or another Ledger Nano device, and the thief cannot remove your funds without the PIN. Any time you use a cryptocurrency-related service, even if it was recommended by a friend, you should check reviews of their service. One easy way to do this is to type “[name of service] reddit” into a search engine. For example, if I type “Bitfinex reddit” into Google, it will give me Reddit’s Bitfinex page, where I will quickly learn that they are experiencing severe customer service delays due to unprecedented new user signups. 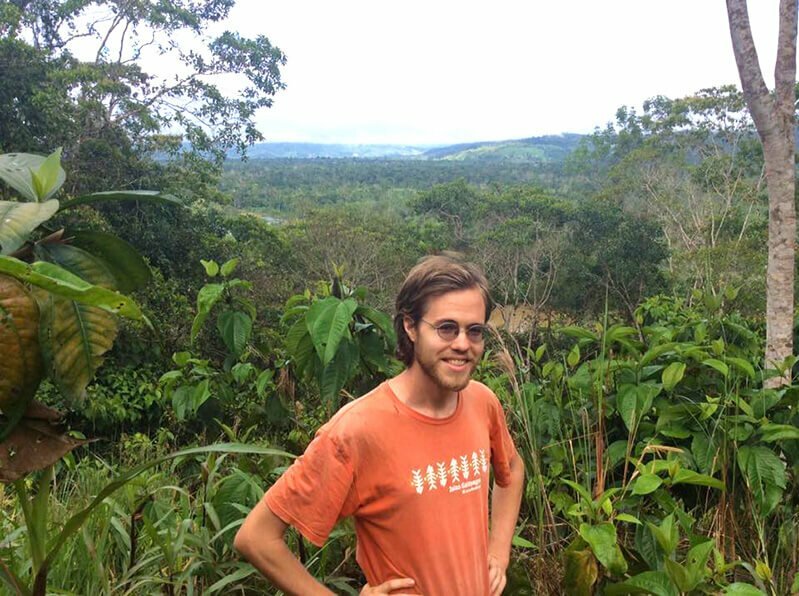 Peter Csere teamed up with fellow fruit lovers Jay Kaiser and Jason Kvestad in scoping out land that would become Terra Frutis in Ecuador. He has researched cryptocurrencies over the past several years. 1. Find out which of your friends are interested in cryptocurrencies and encourage them to install wallet apps on their phones so that you can interact among yourselves using ethical money rather than Central Bank-issued toilet paper. 2. Find out which of your friends are interested in precious metals and encourage them to use small-denomination gold and silver coins to settle debts between friends. I would love to be able to pay my friend a gram of gold when I owe him $55 or one of my Lakota silver ounce coins when I owe her $18. And there’s something much more satisfying about receiving a precious metal coin rather than a flimsy piece of paper with some old politician’s face on it. 3. Diversify your savings as much as possible into my favorite assets: cryptocurrencies, gold, silver and fruit-producing land in the tropics. 4. Get educated. Read about the Austrian school of economics, monetary policy and the history of currency, trade, barter, etc. Even just a little reading into nontraditional economic theories will open your mind about how much our financial systems shape our world. 5. Following steps 1 and 2, find out how many ways you can use cryptocurrencies and precious metals in your daily life! 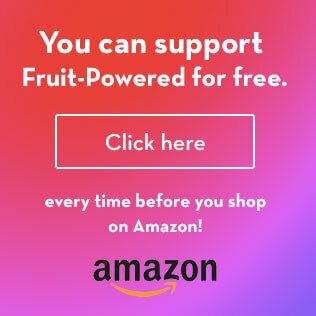 When I lived in the United States, I used to buy Whole Foods gift cards with bitcoins so that I could buy my organic fruit using sound currency for at least one step of the transaction. I also bought gift cards for Amazon.com and gas stations with cryptocurrency. I found a website that allowed me to top up my cell minutes with crypto. I bought gold and silver coins from Amagi Metals, a precious-metals dealer that accepts BTC. You’d be surprised how easily you can get away from the “almighty petrodollar” if you just install a few apps on your smartphone and get the hang of transacting in alternative currencies. Peter Julius Csere joined friends Jason Kvestad and Jay Kaiser [a.k.a. Jay Yogi] in forming the growing Ecuadorian community of raw vegans Terra Frutis. 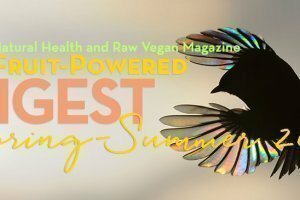 Peter has also spearheaded the nearby Fruit Haven project and continues to organize, consult and do “boots on the ground” work for additional raw vegan communities. Wow that was well packed with information! Great write up Peter! And Brian for hosting this! Absolutely! Peter was the right person for this story and did a fantastic job. I am grateful to have published this in Fruit-Powered Digest. Thank you for all the work you do at Terra Frutis! Very well written article with awesome information in a form that the average user can understand.. I did want to point out while IOTA has quantum resistant possibilities (will require forking, and causing serious headaches for legacy coin holders), QRL will be resistant from genesis block forward. Thanks for the info! I have some QRL as well in my portfolio.